Anna is a Board Certified Physician Assistant at Brevard Medical Dermatology in Viera/Melbourne and Titusville, FL. Anna was raised locally in Rockledge, FL, but left for over 10 years to pursue her education and start her career. Anna earned both a B.S.in Biomedical Sciences and a Master’s of Public Health from University of South Florida. Her last semester of USF was spent in Costa Rica, where she performed public health research and completed courses through the Monteverde Institute and University of Costa Rica. Anna then moved to Philadelphia, where she earned a Master’s of Health Sciences degree from Drexel University’s Physician Assistant program and served as President of her PA class. Anna worked as a Physician Assistant in Internal Medicine in Albany, GA prior to moving back to Brevard County to pursue her dream of working in Dermatology in her hometown. Anna specializes in both medical and cosmetic dermatology of skin, hair, and nails. 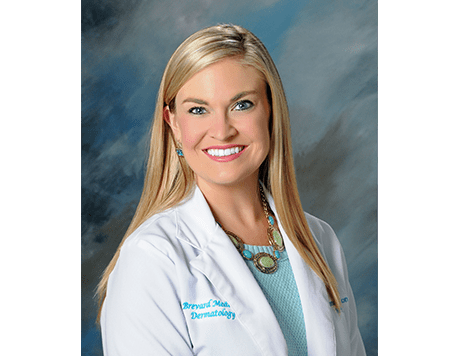 Anna maintains professional affiliations with the American Academy of Physician Assistants (AAPA), Society of Dermatology Physician Assistants, and Space Coast Clinicians. She is also active in the Melbourne Alumnae Panhellenic, an organization that focuses on providing Brevard County sorority women with collegiate scholarships.